The Chevy Volt… named 2011 Motor Trend Car of the Year, the 2011 North American Car of the Year, was recommended by Consumer Reports, and earned the highest safety ratings in 2011 from the Insurance Institute for Highway Safety (IIHS) in the first-ever U.S. crash test evaluations of plug-in electric cars. 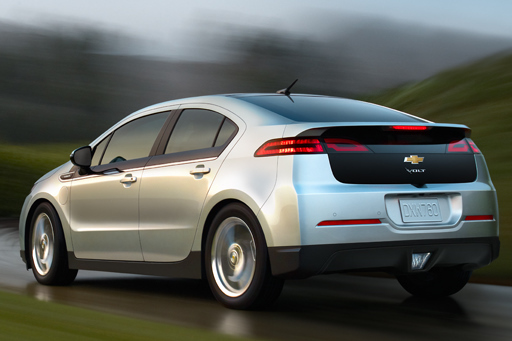 But the wins don’t stop there… the IIHS also named the 2012 Chevrolet Volt a Top Safety Pick for 2012. And Kelley Blue Book just announced the Chevy Volt wins the Kelley Blue Book Total Cost of Ownership Award in the Electric Car category! The Chevy Volt isn’t just winning awards, it’s winning repeat owners! A few months ago Consumer Reports conducted a survey asking new car owners how likely they were to purchase the same vehicle again. In the case of the Chevy Volt, 93% said they would “definitely” buy the car again. Yes, there was an issue with fires occurring in Chevy Volts that had been crashed as part of safety testing, but The U.S. government ended its safety investigation into the Chevrolet Volt after concluding that the Volt and other electric cars don’t pose a greater fire risk than gasoline-powered cars. The National Highway Traffic Safety Administration (NHTSA) and GM know of no fires occurring in real-world crashes. NHTSA said Friday that it “continues to believe that electric vehicles show great promise as a safe and fuel-efficient option,” and based on available data, electric cars don’t appear to be riskier than gas-powered ones. If you want to drive away a winner, don’t wait to win a car, buy a Chevy Volt. Stop by Bob Bell Chevrolet of Bel Air, we have the Chevy Volt on the lot and ready to go. I read a study a few weeks ago that said, “The average age of cars and light trucks now in operation in the U.S. has increased to 10.8 years”. It was written by Polk, a leading global automotive market intelligence firm. This study tells me it’s important for Chevrolet drivers to take care of the vehicles they buy. And you take care of your Chevy by purchasing parts and accessories specifically designed, made and tested to keep your Chevrolet vehicle running at OEM (original equipment from manufacturer) peak performance and appearance—after all, they’re the ones it was born with. Each part works with the others to produce a single output. Many non-genuine parts may claim to be reliable, but they are not produced to meet GM’s engineering and material specifications. Compromise one part and you may unknowingly compromise a whole system. Whether you’re restoring an old favorite or personalizing your new baby, count on Chevrolet to provide genuine replacement dependability. Visit us online to order parts & accessories, or stop by the dealership… either way, let us give you peace of mind knowing you’re taking care of your Chevy.